BBC New reports that, as anticipated for two years (story below), "Pine Island Glacier (PIG), the longest and fastest flowing glacier in the Antarctic, has spawned a huge iceberg... The block measures about 720 square kilometres in area, roughly eight times the size of Manhattan Island in New York." Confirmation that a fissure had spread across the full width of the glacier was confirmed on 8 July with images obtained from the German TerraSAR-X satellite (pictured at right). The fissure was first observed in October 2011 (image below). In this case, the crack is forming significantly farther "upstream" than has previously been the case. That "signifies that there are changes in the ice," Scambos said. When "that point of rifting starts to climb upstream, generally you see some acceleration of the glacier." That means that the ice will flow into the ocean at a faster rate, contributing even more to sea level rise. Such an acceleration is of particular concern at the Pine Island Glacier, because, among Antarctic glaciers, it's "the one that's contributing the most to sea level rise." In fact, he said, ice flows from that glacier alone account for a quarter to a third of Antarctica's total contribution to sea level rise. Pine Island Glacier's vast crack, pictured in October 2011. National Geographic reports that Antarctica's fastest-melting glacier is about to lose a chunk of ice larger than all of New York City, with implications for the rate of rise for sea levels. The crevasse (pictured) is 30 kilometres long and up to 80 metres wide, cutting across the floating tongue of the Pine Island Glacier in West Antarctica, and expected to create an iceberg of about 900 square kilometres. That is larger than the area of Manhattan, Brooklyn, Queens, Staten Island and the Bronx combined, according to NASA. In Australian terms, it is larger than the Adelaide Metropolitan Region. 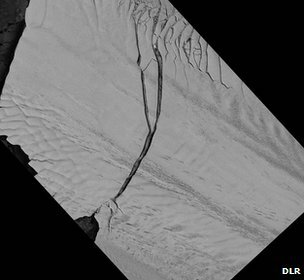 Eric Rignot of NASA's Jet Propulsion Laboratory says the monster iceberg will be created "in the coming months for sure." Update 28 June 2011: Columbia University researchers have just reported that "Ocean Currents Speed Melting of Antarctic Ice". They find that "Stronger ocean currents beneath West Antarctica’s Pine Island Glacier Ice Shelf are eroding the ice from below, speeding the melting of the glacier as a whole, according to a new study in Nature Geoscience. A growing cavity beneath the ice shelf has allowed more warm water to melt the ice, the researchers say—a process that feeds back into the ongoing rise in global sea levels. The glacier is currently sliding into the sea at a clip of four kilometers (2.5 miles) a year, while its ice shelf is melting at about 80 cubic kilometers a year - 50 percent faster than it was in the early 1990s - the paper estimates." For discussion of map/image, see here. The Victorian and Queensland governments decisions to stick to an "upper boundary" sea-level rise estimate of 0.8 metres by 2100 (and NSW at 0.9 metre) for planning purposes needs urgent revision, with new modelling showing two West Antarctic glaciers are past their tipping points. A study published in the Proceedings of the National Academy of Sciences in December found that global average sea levels are likely to rise by between 75cm and190cm by the end of the century. So how far could we reasonably expect sea levels to rise by 2100? As the world's oceans warm, they expand and sea-levels rise, but how quickly the loss of polar ice sheets will add to the rise is difficult to estimate, principally because ice-sheet and sea-ice dynamics are not sufficiently well understood, and they are subject to non-linear (rapid and unexpected) changes, such as is occurring with sea-ice in the Arctic. The question is no longer whether the Greenland and West Antarctic ice sheets (WAIS) are losing mass (they are!) but if and when they pass tipping points for large, irreversible ice mass loss, and how fast that will occur. Recent research by Blancon et. al published in Nature in 2009 examining the paleoclimate record shows sea level rises of 3 metres in 50 years due to the rapid melting of ice sheets 120,000 years ago. Mike Kearney, of the University of Maryland, said it's "within the realm of possibility" that global warming will trigger a sudden collapse of the West Antarctic ice sheet, which could lead to a rapid increase in sea levels like that predicted by the study. Oxygen isotopes in the deep-ocean fossil plankton known as foraminifera reveal that the Earth was last 2°C to 3°C warmer around 3 million years ago, with carbon dioxide levels of perhaps 350 to 450 parts per million. It was a dramatically different planet then, with no Arctic sea-ice in the warm seasons and sea level about 25 meters higher, give or take 10 meters. Even if we would curb all CO2 emissions today, and stabilise at the modern level (387 parts per million by volume), then our natural relationship suggests that sea level would continue to rise to about 25 metres above the present. A major Antarctic glacier has passed its tipping point, according to a new modelling study. After losing increasing amounts of ice over the past decades, it is poised to collapse in a catastrophe that could raise global sea levels by 24 centimetres. Pine Island glacier (PIG) is one of many at the fringes of the West Antarctic ice sheet. In 2004, satellite observations showed that it had started to thin, and that ice was flowing into the Amundsen Sea 25 per cent faster than it had 30 years before. Now, the first study to model changes in an ice sheet in three dimensions shows that PIG has probably passed a critical "tipping point" and is irreversibly on track to lose 50 per cent of its ice in as little as 100 years, significantly raising global sea levels. The team that carried out the study admits their model can represent only a simplified version of the physics that govern changes in glaciers, but say that if anything, the model is optimistic and PIG will disappear faster than it projects. Richard Katz of the University of Oxford and colleagues developed the model to explore whether the retreat of the "grounding line" – the undersea junction at which a floating ice shelf becomes an ice sheet grounded on the sea bed – could cause ice sheets to collapse. The model suggests that within 100 years, PIG's grounding line could have retreated over 200 kilometres. "Before the retreating grounding line comes to a rest at some unknown point on the inner slope, PIG will have lost 50 per cent of its ice, contributing 24 centimetres to global sea levels," says Richard Hindmarsh of the British Antarctic Survey, who did not participate in the study. This assumes that the grounding line does eventually stabilise, after much of PIG is gone. In reality, PIG could disappear entirely, says Hindmarsh. "If Thwaite's glacier, which sits alongside PIG, also retreats, PIG's grounding line could retreat even further back to a second crest, causing sea levels to rise by 52 centimetres." The model suggests Thwaite's glacier has also passed its tipping point. An unmanned autonomous submarine has discovered a sea-floor ridge that may have been the last hope for stopping the now-accelerating retreat of the Pine Island Glacier, a crumbling keystone of the West Antarctic Ice Sheet, researchers announced at the fall meeting of the American Geophysical Union. An unmanned autonomous submarine has discovered a sea-floor ridge that may have been the last hope for stopping the now-accelerating retreat of the Pine Island Glacier, a crumbling keystone of the West Antarctic Ice Sheet. The ridge appears to have once protected the glacier, but no more. The submarine found the glacier floating well off the ridge and warmer, ice-melting water passing over the ridge and farther under the ice. And no survey, underwater or airborne, has found another such glacier-preserving obstacle for the next 250 kilometers landward. 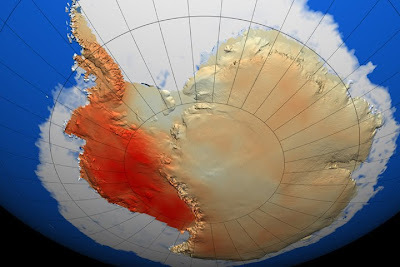 The Pine Island and adjacent Thwaites glaciers are key to the fate of West Antarctic ice, says glaciologist Richard Alley of Pennsylvania State University, University Park, in an e-mail. And West Antarctica is key to how fast and far sea level will rise in a warming world. "To a policymaker, I suspect that the continuing list of [such] ice-sheet surprises is not reassuring," he writes. At the meeting, glaciologist Adrian Jenkins of the British Antarctic Survey in Cambridge and colleagues described how the instrument-laden Autosub3 cruised for 94 hours along 510 kilometers of track beneath the floating portion of the Pine Island Glacier in January 2009. The sub found a 300-meter-high ridge across the ocean cavity formed by the floating end of the glacier. Deep, warmer water was overtopping the ridge and passing through the gap between floating ice and the ridge top on its way to melting back more of the glacier. That gap has been growing, Jenkins said, perhaps since the 1970s. An aerial photograph from 1973 shows a bump in the ice where the ridge is now known to be, suggesting that the ice was then resting on the ridge and no warmer water could have been getting through. Although the last physical obstacle to continued melting and retreat of the Pine Island Glacier has been breached, the ice's fate remains murky, says glaciologist David Holland of New York University in New York City. That's because glaciologists aren't sure what got the glacial retreat started in the first place, he notes. It wasn't the greenhouse simply warming the ocean, researchers agree. Instead, shifting winds around Antarctica in recent decades may have driven warmer waters up to the ice and dislodged it from its perch on the ridge. But what caused the winds to shift? Global warming? The ozone hole? Random variability? Glaciologists—and policymakers—would like to know. Another vulnerable place on the West Antarctic ice sheet is Pine Island Bay, where two large glaciers, Pine Island and Thwaites, drain about 40 per cent of the ice sheet into the sea. The glaciers are responding to rapid melting of their ice shelves and their rate of ﬂ ow has doubled, whilst the rate of mass loss of ice from their catchment has now tripled. NASA glaciologist Eric Rignot has studied the Pine Island glacier, and his work has led climate writer Fred Pearce to conclude that ‘the glacier is primed for runaway destruction’. 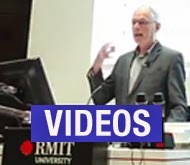 Pearce also notes the work of Terry Hughes of the University of Maine, who says that the collapse of the Pine Island and Thwaites glaciers — already the biggest causes of global sea-level rises — could destabilise the whole of the West Antarctic ice sheet. 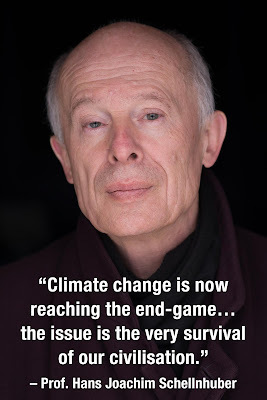 Pearce is also swayed by geologist Richard Alley, who says there is ‘a possibility that the West Antarctic ice sheet could collapse and raise sea levels by 6 yards [5.5 metres]’, this century. So much for 0.8 metres being a risk-averse foundation for sea-level rise planning and policy-making. 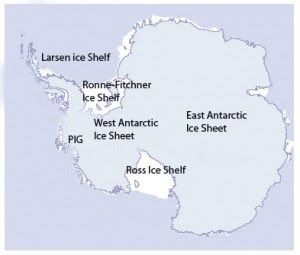 And for a fuller discussion on the current research on PIG and recent observations, there is a great overview, "Is Pine Island Glacier the Weak Underbelly of the West Antarctic Ice Sheet?" at RealClimate, from November 2009. If we listen to the scientist’s warnings, and take avoiding action now, it will allow a small window of opportunity for corrective contingency and implementation measures; that largely depend on a global response, for the right course of action to take in time, before any tipping point is reached. If we ignore the warnings, then it is business as usual, there will be more Casualties, from ripple effect geopolitical turmoil, spawned by an increasingly unstable global Eco-system, which will continue to make corrective adaptive measures, as it strives to maintain global ambiance. One of those adaptive measures could be earths natural response to a perceived global heating event, this could take the form of rapid global cooling as accelerated polar melt starts to influence the earths gulf stream, which is the earths major heat exchange mechanism, responsible for maintaining global ambient temperatures, that all dependent species, have enjoyed up till now. We must not discount the planets ability for radical simpatico adaptation or second guess our earth’s superior Eco system which has survived for eons in hostile space environments. The part we play may be minuscule in comparison, however misguided in the extreme. 1. Make sure emissions peak in 2012 and decrease as rapidly as possible towards zero after that. 2. Developed countries must make cuts of 50 percent on their 1990 carbon emissions by 2030 with mandatory regulation by United Nations. There is an inexorable link between global Eco-equity and global financial equity. It is clear there is a need to link global sustainable economies, with global Eco-sustainability. Failure to coalesce, for the mitigation of global adverse climatic change, in the short term, will force the planet to make that decision for us, whatever action we take then, will ultimately benefit the planet. You said if we pay attention to this issue now we could potentally fix or atleast help it. I both agree and disagree with this statement. Most of the facts lead to people being the problem behind this, but some dont. I really wish enough people cared enough about this issure to changed their ways but the truth is they dont. The people as a whole have to contribute and help stop or lower c02 emmisions. And some people either dont know the facts or dont care. And there really is no way to change thier mind. 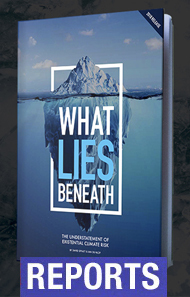 I believe we will be galvanized into action sooner rather than later, by a truly biblical global environmental event, that will be the wake up call for all nations to come together as one. As always we are at our very best with our backs against the wall, fighting for a common cause. It would not be a fitting Epitaph for our species, that we gave up without a fight.